Marta and Alex Morgan both scored as the Orlando Pride beat the Washington Spirit 3-0 on Tuesday night in front of a crowd of 4,273 at Orlando City Stadium in Orlando, Florida. All three goals came in a 12 minute span in the second half as the Pride moved themselves into a tie for 5th place with Sky Blue FC before the two teams face each other on Saturday night. Though the goals came after halftime, the Pride were off and running from the start with a few early chances, courtesy of Marta, who was all over the field in the first half with a few of her patented moves. The Spirit also had a few nice chances in the first half, but neither team could find the back of the net. In the 22nd minute, Cheyna Williams, who scored on Friday in Washington’s big 4-1 win over Sky Blue FC, took a few nice touches to get around Pride midfielder Alanna Kennedy, but her shot went just wide. Marta’s goal came in the 52nd minute to give Orlando the 1-0 lead. After a goal kick from Spirit goalkeeper Stephanie Labbé, Pride midfielder Maddy Evans won the header at midfield, sending it to Marta, who brought down the high ball. Marta then picked out Morgan, holding up her run to stay onside. The give-and-go was on as Marta sprinted up the field and Morgan passed it back to her. 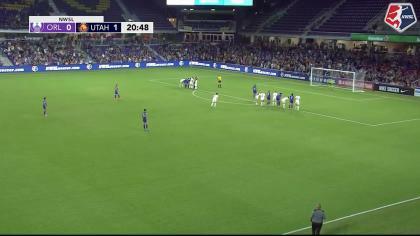 Marta then outran the Spirit defensive line and, as Labbé tried to come out to make a play, dribbled around the keeper. While falling down, Marta hit a right-footed shot from a tight-angle and into the net for her ninth goal of the season. Five minutes later, the Pride doubled the lead. Kennedy sent a long ball over the top as Morgan made a run down the center of the field. Labbé came out of the box to try to intercept it, but only had enough time to head the ball away from Morgan. Labbé’s header went to the middle of the field and right to Camila, 40 yards from goal. Camila took one touch to chip it over Labbé for her fourth goal of the season. The final goal of the night came in the 64th minute on a nice pass from Steph Catley. The left back launched a left-footed cross from the left-wing and over the top to Morgan on the right side of the field, hitting her in stride. Morgan let the ball bounce once, then hammered a right-footed blast to the near post and out of the reach of Labbé. The Spirit, who came off a big win on Friday, could not find a shot on goal in the match and finished the match with eight total shots compared to the Pride’s 17. The Pride now face Sky Blue FC on Saturday night with both teams tied on 23 points, just one behind Seattle Reign FC for the fourth and final playoff spot. 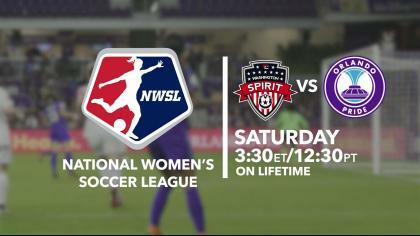 The Spirit will host the Breakers on Saturday in the NWSL Game of the Week on Lifetime on Saturday afternoon at 3:30 p.m. ET. Match ends, Orlando Pride 3, Washington Spirit 0. Second Half ends, Orlando Pride 3, Washington Spirit 0. Offside, Washington Spirit. Cali Farquharson tries a through ball, but Cheyna Williams is caught offside. Foul by Danica Evans (Orlando Pride). Attempt missed. Cheyna Williams (Washington Spirit) right footed shot from outside the box is close, but misses to the right. Attempt saved. Danica Evans (Orlando Pride) right footed shot from more than 35 yards is saved in the centre of the goal. Assisted by Aubrey Bledsoe. Aubrey Bledsoe (Orlando Pride) wins a free kick in the defensive half. Corner, Washington Spirit. Conceded by Kristen Edmonds. Substitution, Orlando Pride. Nickolette Driesse replaces Marta. Attempt missed. 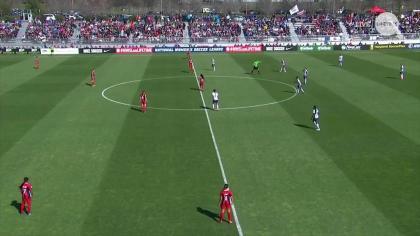 Estefanía Banini (Washington Spirit) right footed shot from outside the box misses to the right. Substitution, Washington Spirit. Estefanía Banini replaces Mallory Pugh. Attempt missed. Cheyna Williams (Washington Spirit) right footed shot from outside the box is high and wide to the right. Assisted by Cali Farquharson. Substitution, Orlando Pride. Danica Evans replaces Alex Morgan. Attempt missed. Alanna Kennedy (Orlando Pride) header from very close range is too high. Assisted by Camila with a cross following a corner. Corner, Orlando Pride. Conceded by Kassey Kallman. Attempt blocked. Marta (Orlando Pride) left footed shot from the centre of the box is blocked. Assisted by Alex Morgan. Offside, Washington Spirit. Caprice Dydasco tries a through ball, but Cali Farquharson is caught offside. Goal! Orlando Pride 3, Washington Spirit 0. Alex Morgan (Orlando Pride) right footed shot from the centre of the box to the top right corner. Assisted by Stephanie Catley with a through ball. Substitution, Washington Spirit. Cali Farquharson replaces Arielle Ship. Corner, Washington Spirit. Conceded by Stephanie Catley. Goal! Orlando Pride 2, Washington Spirit 0. Camila (Orlando Pride) right footed shot from outside the box to the centre of the goal. Delay in match Whitney Church (Washington Spirit) because of an injury. Goal! Orlando Pride 1, Washington Spirit 0. Marta (Orlando Pride) right footed shot from the right side of the six yard box to the centre of the goal. Assisted by Alex Morgan with a through ball. Attempt blocked. Alex Morgan (Orlando Pride) left footed shot from the left side of the six yard box is blocked. Assisted by Chioma Ubogagu with a cross. Attempt missed. Cheyna Williams (Washington Spirit) left footed shot from the centre of the box is just a bit too high. Assisted by Caprice Dydasco with a cross. Offside, Washington Spirit. Mallory Pugh tries a through ball, but Arielle Ship is caught offside. Attempt missed. Alanna Kennedy (Orlando Pride) left footed shot from outside the box is close, but misses to the right. Offside, Orlando Pride. Marta tries a through ball, but Chioma Ubogagu is caught offside. Attempt missed. Marta (Orlando Pride) right footed shot from outside the box is just a bit too high. Attempt missed. Mônica (Orlando Pride) header from the centre of the box is close, but misses to the left. Assisted by Stephanie Catley with a cross following a corner. Corner, Orlando Pride. Conceded by Stephanie Labbé. Attempt saved. Alex Morgan (Orlando Pride) left footed shot from outside the box is saved in the bottom left corner. Assisted by Chioma Ubogagu. Attempt missed. Estelle Johnson (Washington Spirit) right footed shot from outside the box misses to the right. Assisted by Tori Huster. Attempt blocked. Cheyna Williams (Washington Spirit) left footed shot from the centre of the box is blocked. Attempt saved. Marta (Orlando Pride) left footed shot from outside the box is saved in the centre of the goal. Assisted by Alex Morgan. Attempt blocked. Marta (Orlando Pride) left footed shot from a difficult angle on the right is blocked. Assisted by Chioma Ubogagu. Offside, Washington Spirit. Mallory Pugh tries a through ball, but Havana Solaun is caught offside. Attempt missed. Cheyna Williams (Washington Spirit) right footed shot from outside the box is close, but misses to the left. Assisted by Caprice Dydasco with a headed pass. Offside, Orlando Pride. Aubrey Bledsoe tries a through ball, but Chioma Ubogagu is caught offside. Attempt blocked. Marta (Orlando Pride) left footed shot from the right side of the box is blocked. Assisted by Alex Morgan. Attempt missed. Marta (Orlando Pride) left footed shot from outside the box is close, but misses to the left. Assisted by Maddy Evans. Attempt blocked. Alex Morgan (Orlando Pride) left footed shot from outside the box is blocked. Assisted by Marta. Attempt missed. Marta (Orlando Pride) left footed shot from the centre of the box is close, but misses to the left. Assisted by Chioma Ubogagu with a through ball.